We all enjoy making our homes individual, unique and that can mean having shapes and sizes which are out of the ordinary. But the search for something original shouldn’t mean we have to sacrifice style. Which is why Luxaflex® have a wide range of stunning options for windows and doors in all shapes and sizes – still offering superb light control and just the right levels of privacy. It doesn’t matter if you don’t know your stationary arch from your extended, or your half or quarter circle from your perfect or imperfect. We’ve successfully dressed every eyebrow and gothic arch we’ve ever been faced with and everything in between. We’ll sort out the geometry, you just concentrate on finding a style you love. 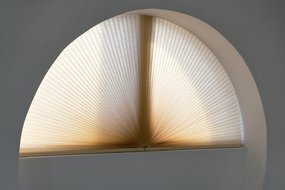 However unique the window shape, we will find a beautiful shade or blind to complement it. Open your shades or blinds from the top…or the bottom…and enjoy as much natural light as you want – balanced with the level of privacy you’re looking for. Almost all of the Luxaflex® range can be used to dress a traditional patio or sliding glass door. However, we do recommend our ‘Top-Down/ Bottom-Up’ operation for easy operation with flexible light control and privacy. 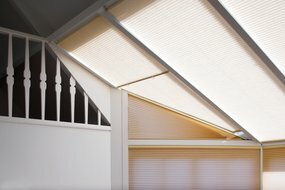 Control the sun’s glare and stop your conservatory or loft space turning into a comfortable space.